Let’s face it – whether you’re applying for internships or recruiting interns for your company, the process can be tedious, boring or downright inefficient. Presenting Gametize’s very own Internship Challenge! Like any internship application, interns-to-be are given the opportunity to market their skills and knowledge, seeking a right match with Gametize. With Gametize’s Internship Challenge created on our native game platform, you’re given much more freedom to express yourself and have a chance to showcase your personality!. 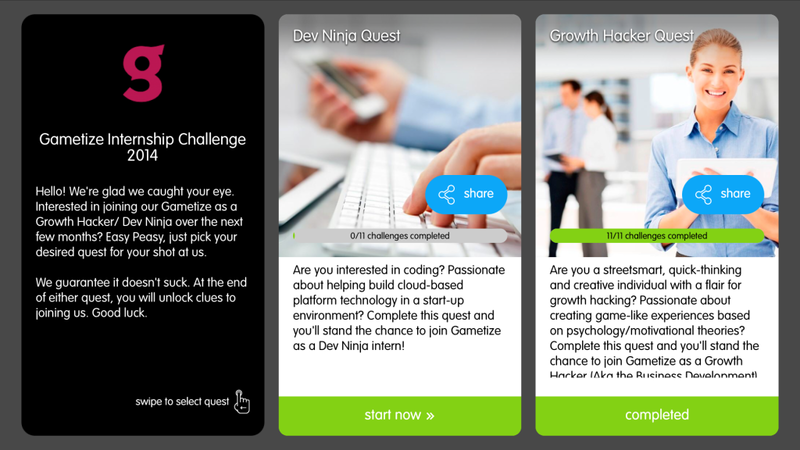 Do you want to be a Dev Ninja, supporting the Gametize web and mobile platforms behind the scenes? Or do you want to be a Growth Hacker, constantly finding ways to engage players and increase Gametize’s brand and product outreach? The Internship Challenge includes each of these roles as separate quests for clarity’s sake, but you can apply to both if you’re game for it! If you’re not sure exactly what these roles entail and whether or not you meet the requirements, all you have to do is take a look at the Mission Brief at the start of each quest. 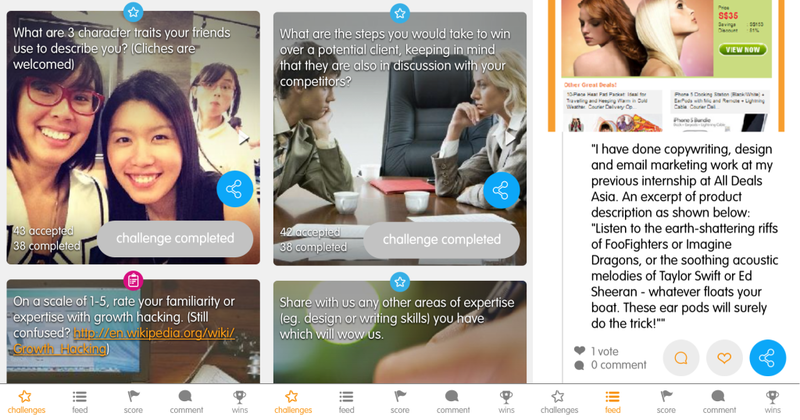 The Internship Challenge was created using Gametize’s intuitive native platform. Getting to know you is just as important as you getting to know us! We would love for you to join us as a Gametize Ninja, but first we need to ask: Why do you want to intern at Gametize and what do you hope to learn from this internship? We take our internships very seriously and will not hesitate to give these limited places to those who want it most. And of course, we expect you to familiarise yourself with what we do at Gametize too (don’t worry, we’ve provided handy links you can refer to). Do your research! Notice the blue buttons? Answers can also be shared to Facebook, Twitter and Instagram. Also, click the heart icon to vote on someone else’s answer! Step 3: Who Are You? What are your areas of expertise? What are 3 words your friends use to describe you? Which 3 items would you want to have if you were trapped on a deserted island? It may sound simple enough, but we’re dying to know who you are! Knowledge and skills are important, but we want to make sure you’re a good fit for our company culture too. Also, feel free to demonstrate your creativity – prove that you’re people-oriented by attaching a photo of you and your circle of friends, or show us your design skills by linking to your online portfolio. Feel free to attach images to your answers – After all, a picture is worth a thousand words.